The Albright bedroom collection offers casual elegance to your master suite. Constructed from pine solids and birch veneers, bookmatched veneers take a V-shape on the drawer fronts and bed for a sophisticated design detail. The dark cherry finish complements the shiny metal drawer hardware, hexagonal shaped knobs with hexagonal back plates. Bedroom storage pieces features slightly recessed top drawers for a chest-on-chest look. Store items and display accents with the unique and sophisticated style of this chest. Constructed from pine solids and birch veneers, bookmatched veneers take a V-shape on the drawer fronts of this chest of drawers. The dark cherry finish complements the shiny metal drawer hardware, hexagonal shaped knobs with hexagonal back plates. 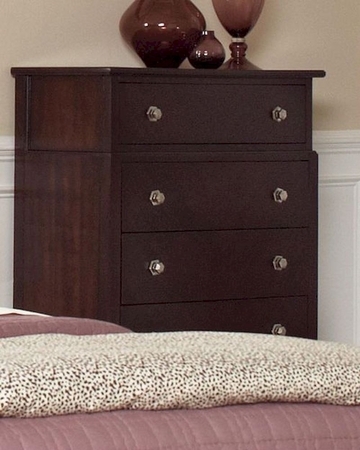 With a recessed top drawer, this chest showcases a chest-on-chest look. The top drawer is felt-lined to accommodate delicate items.